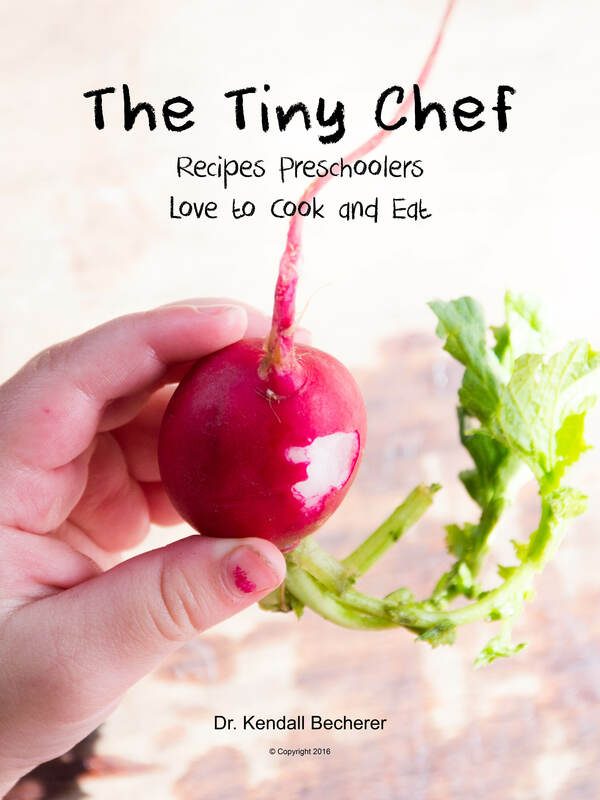 The Tiny Chef book is written for you to read with your preschooler. It has tons of pictures of kids preparing food, 25 simple recipes, and large-print instructions that beginning readers can tackle with your help. Kids want to participate in their family's everyday activities from a young age, but adults don't always know how to give them meaningful tasks that are appropriate for their ability level. This book is designed to inspire you and your young chef to prepare food together, inside or outside of the kitchen. The photos in this book demonstrate how children, ages 8-months to 5-years, are capable of feeding themselves and helping to prepare delicious meals. The Tiny Chef book is now available for a lower price on Amazon's CreateSpace! Click here or on the image to view The Tiny Chef book in the CreateSpace store. ​If you decide to order the book from Amazon, make sure to check the quality of the printing and ask for a re-print if it doesn't seem satisfactory. Sometimes they don't trim the books correctly, cutting the top off and leaving a white line at the bottom of all of the pages (the images should go all the way to the bottom edges). At least they're very accommodating about sending a new copy if they make a mistake! "Make meals while connecting with your kids!" "This book is a favorite for my 3 1/2 yo boys! We love deciding on a recipe to make together and following the very simple instructions. This book has inspired us through the beautiful photos, and most of the recipes are made with ingredients I already have in the fridge or pantry. My favorite part is the back of the book that gives quick ideas on what your kids can help with in the kitchen: ingredients for chopping, tearing, mashing, skewering, and more. This book has definitely been a fun way to connect with my children, while also teaching them some very important skills. I highly recommend this book, your kids (and you) will really enjoy it!" "My son is almost 3 and is very curious about what all he can do with food. This book helped me find ways to involve him in his meal or snack preparations. I find that he's more excited about eating food that he helped prepare. This is the perfect book for parents of little, picky but curious children." If you're just starting on your kid-friendly food prep journey, check out the TCK Getting Started Guide. There are six main lessons in this guide that are organized to teach you about preparing food with young ones: who and what is involved, where & how to work together, and when & why you want to do this kind of work. We’ll cover the topics of motivation (what interests you and your child about food preparation? ), simplification (what kinds of activities can young children do in the kitchen? ), learning zones (how do you figure out what food preparation activities your child can do? ), development (what developmental needs do you need to consider when including a young child in such complex activities? ), small steps (when and how do you get started? ), and environment (how do you set up your cooking space to accommodate a preschooler?). This ebook is a guide for caregivers who are searching for information on how to help their curious, hungry, and very capable young children learn skills and gain confidence in food preparation.